Whether you are purchasing gold bullion in Canada or anywhere else in the world, Canadian Gold Maple Leaf coins are among the top gold bullion sellers due to their high quality, impeccable reputation and unsurpassed value. Canadian Maple Leaf gold bullion coins are minted from the purest 24 karat grade of gold and contain one full troy ounce of the gold metal. One ounce is not the only size Canadian gold maple leaf coins are manufactured in, they are also minted in the following weights, namely, 1/20, 1/10, ¼ and ½ of an ounce of pure gold. Canadian Gold Maple Leaf coins are proudly manufactured at the Royal Canadian Mint located in Ottawa and Winnipeg, Canada. Canadian Gold Maple Leaf coins’ obverse side is embellished with an elegant image of Elizabeth II and the reverse side carries Canada’s National symbol, the Maple Leaf, hence the name of the coin. When you purchase Canadian Gold Maple Leaf coins, take special measures to ensure safe storage and care for your prized possessions. 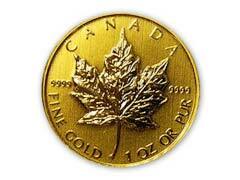 Gold Maple Leaf coins are struck from 24 karat gold and will scratch easily. If you are looking for Canadian gold coins for sale, check out Northwest Territorial Mint, a trustworthy bullion dealer specializing in Canadian bullion coins. You can also look into their special wholesale pricing if you are buying larger quantities. Did you know that Royal Canadian Mint produced a unique 100 kilo Canadian Gold Maple Leaf coin, the largest bullion coin in the world in 2007? This was mainly done with the purpose to draw attention to gold bullion in Canada and specifically to Gold Maple Leaf coins. This was well received among global gold investors and according to Wikipedia, Royal Canadian Mint is currently working on fulfilling five orders on these massive bullion coins.